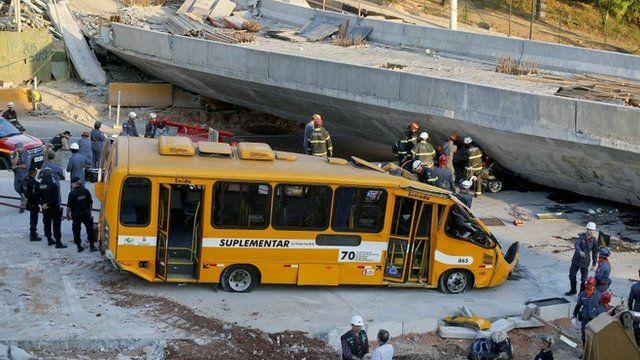 Two people have been killed after a flyover collapsed on to vehicles in the Brazilian city of Belo Horizonte. The concrete and steel bridge, which was under construction, fell on to traffic on a busy highway. A commuter bus was crushed, killing the driver, along with two unoccupied trucks. A body was also recovered from a car trapped beneath the rubble. The south-eastern Brazilian city is due to host a football World Cup semi-final match next week.